Poet Philipp Khabo Koepsell and trumpeter Christine Kamau were the second pair featured at the Goethe-Institut Kenya’s Artistic Encounters on April 13, 2017. The event ended with a panel discussion moderated by curator Zukiswa Wanner. Earlier in the year, the Goethe-Institut in Kenya commissioned novelist and journalist Zukiswa Wanner to start a project simply called “Artistic Encounters.” The project was an experimental project where two artists in different artistic genres would showcase their work to an audience at the institute’s Maendeleo House in Nairobi. The first duo of artists featured were artist Victor Ehikhamenor and poet Koleka Putuma and Nairobi turned out for the new event. 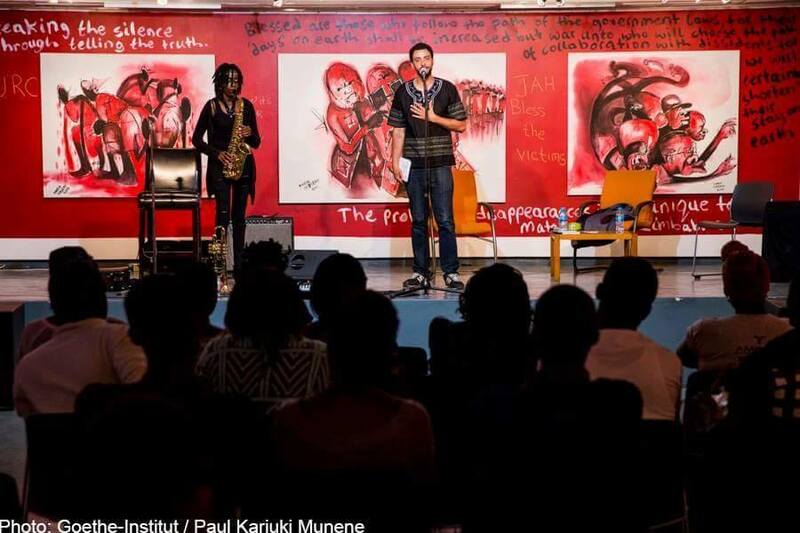 On April 13, it was Kenyan trumpeter Christine Kamau’s turn to share the stage with German-South African poet Philipp Khabo Koepsell. Christine Kamau is a Kenyan instrumentalist who plays the trumpet and the saxophone. She has performed at various local music festivals and has appeared in the BBC series African Beats which features emerging African musicians. Philipp Khabo Koepsell is a German Spoken-Word -Performer, dramaturge and publisher. He works with various artistic formats, from poetry, drama, performance and multimedia installation, linking academic and artistic content. The evening started with performances from the two with Christine performing both on the trumpet and the saxophone while Philipp performed his poetry which is very socially conscious. The image in this post was taken by Paul Munene.